Shruti Sachdeva is a Client Servicing Manager at Energetic Stars. She is friendly, fun loving, and hardworking person who excels in nurturing company culture, and creating meaningful experiences for clients and co-workers alike. She earned Bachelor’s degree from Delhi University and now with her job she also invests her time in her studies for Masters in Business Administration. 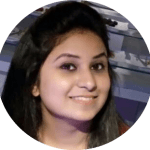 Her energy of doing mischievous things and crave for knowledge, finding new ways of customer handling makes her to stand out from the crowd and makes her more creative. In her spare time, Shruti enjoys cooking, reading, spending time with family and friends! Although not musically inclined in any way, shape, or form, Shruti loves singing because she feels it’s a Stress Burster. Moreover she was always appraised for her singing skills since her school days. Why asking reviews from customers is important ?